Previously concerning Joseph, we considered how his life foreshadowed the greater work of Jesus Christ and how he was likewise sold for silver into Gentile hands (Ishmaelites in Joseph’s case). 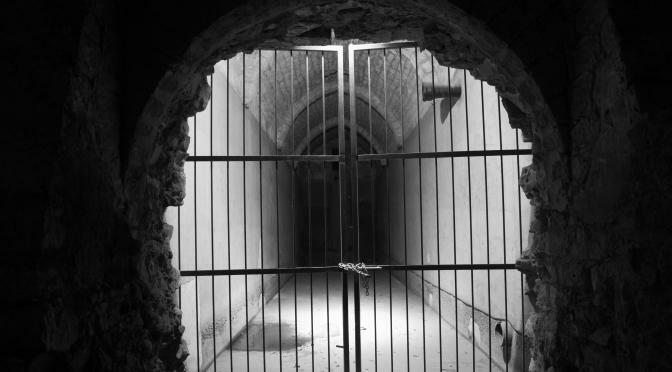 In this article, we will continue upon that theme of Yoseph as a type of the Savior and reflect upon how he figuratively visited Hades, the prison of the dead, as did Yeshua haMashiach (a.k.a., Messiah ben Yoseph). Indeed, the entire turbulent life and perilous plight of Joseph was very much an Old Testament Gospel written in shadows of the Good Shepherd. Hence, we will continue to draw out the Substance of those shadows as we journey from the Suffering Servant similitudes to revelations of the coming Conquering King Messiah. In this article we will begin with Joseph in prison as a type of spiritual afterlife for those held in judgement, whereat Christ preached the Good News and apocalyptic signs of things soon to come (see 2 Pet. 3:18-20; 4:6). Interestingly, Joseph said that interpretations belong to God, but then he asked them to tell him of the dreams so that he could interpret them. This literary, subtle allusion of Joseph as YHVH God is common in messianic prophecies. For example, Elohim YHVH says in Zechariah that “they shall look upon Me whom they have pierced,” when the Messiah Yeshua was the One literally crucified. Thus, there is an intimate connection between the vessels of Divine salvation, whom God utilizes to pour out His transcendent truths, and His Spirit working through them. The difference, however, between the prophets of God and Messiah is that God’s Spirit comes upon prophets at various times to give revelations, whereas the Messiah is One with the Spirit, on whom the Holy Spirit abides. Messiah is the Right Hand of the invisible God over creation. Although the Spirit can give and interpret revelations from Heaven to and for anyone, the baker and butler not having anyone to give them interpretations of their dreams alludes to the primacy of Messiah in Revelation, as designed by God, whereat no one in Heaven or on Earth was able to unseal God’s judgment scroll except the sacrificial Lamb. Even the most spiritually discerning prophets, such as Daniel, received many enigmatic messages that remained sealed from their comprehension- things left for the end of the age. The second suggestion, connected with Joseph revealing Divine revelation in the Egyptian prison, is that Christ had to die and rise from the dead before the Holy Spirit came to reveal the deep things of God’s New Covenant, which was during the time of Pentecost (Shavuot). Joseph’s revelations concerning the third day fates of the baker and butler were designed to foreshadow the Messiah opening the Book of Revelation to show the judgements of life and death concerning the third millennial day from the cross- the coming Great Sabbath. 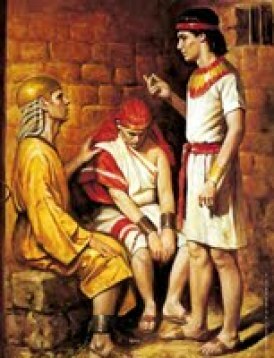 Obviously, Joseph revealed that the dreams were prophetic and relevant for his own age, concerning the fates of two Egyptian men for the third day after their revelations, but what we want to know is how the story relates to Messiah preaching the Gospel and coming Kingdom in the prison of the dead. We want to know the greater, panoramic reason for God orchestrating all of these mysterious things that happened to Joseph. The judgment and message given to the butler concerns those who are saved in likeness of Christ- restored within three millennial days to stand in honor before God, even as Christ sat down as the Right Hand of God (see Hos. 6:1-3; Acts 7:55). Pharaoh, meaning sun-king, is herein likened to God. Egypt is an example of the world. The vine is the spread of the Word of God- Christ manifest with the Gospel- that blossoms with believers over three millennial days (i.e., days since the cross). Thus, Joseph said, “But remember me when it is well with you,” meaning that we should remember the Messiah ben Yoseph– the Suffering Servant Messiah– and His righteous sacrifice. We are to “make mention” of Him before the Lord YHVH, just as Yeshua said, “Do this in remembrance of Me,” when He shared the wine of His covenant. But there is more to these correlations; we are reminded that Christ was unjustly taken from the Hebrews and delivered to the world (Egypt traditionally represents the world in Judeo-Christian symbolism), which means that we must come to the revelation that the Messiah was indeed a Jew who is appointed to reign in Israel with His elect. We cannot justly conclude that because He has gone into the world that He is finished with His national inheritance, no more than we can view Joseph as a prince among Egyptian Gentiles who forgot about his family. 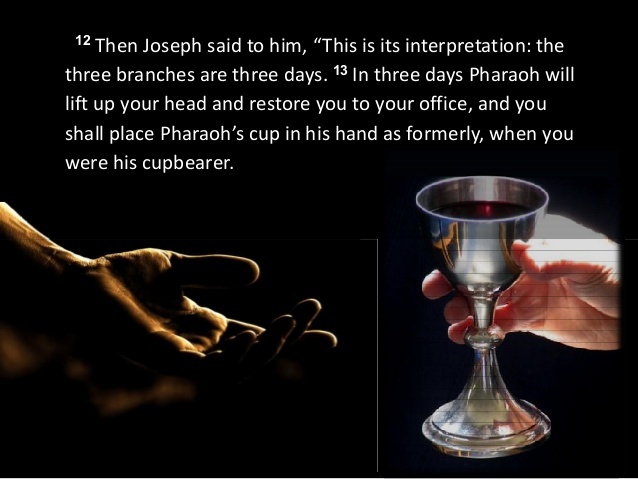 As for grapes that were pressed into the cup, placed in Pharaoh’s hand, tribulations will come even upon all nations during the time of restoration, as a cup placed in God’s hands. Christ will tread the winepress before God on the third millennial day, just as the Butler smashed the grapes in a chalice before Pharaoh. Hence, all of this is prophetic symbolism about the Messiah purging the world and saving believers during tribulations, especially during the Apocalypse. Wine and the fruit of the vine are expressed in these passages because they depict the spread of the Holy Spirit among believers and the work of God in bringing about the Kingdom of Heaven on Earth via His Word, which Christ also awaits (see Mark 14:25). Vineyards require great care to produce good fruits for choice wines, but the real work is by the Holy Spirit for a righteous world. Hence, Christ compared the produce of the covenant of the Law to old wine, and the covenant of His grace to new wine. And just as Israel has suffered purging to bring forth better, more abundant fruits, so has Christianity, and still more comes before our peace during the Great Sabbath (cf. Isa. 63:1-5 and Rev. 14:14-20). Moreover, just as the butler was restored to his choice position before the Pharaoh on the third day, the Lord gives us Divine revelations, like spreading spiritual fruits on a vine, to revive and restore all the children of Israel to live in His presence on the third day from the cross (see Hos. 6:1-3). As for the butler witnessing the vine as it amazingly budded and blossomed with fruit before his eyes, it foreshadowed God witnessing to His chosen priesthood and whom would “bear the iniquity” concerning the Holy Sanctuary. During Moses’ days, the children of Israel had a dispute over which tribe would carry the burden of the priesthood, so they were each given a rod to see which one might miraculously blossom with almonds. On the rod of the tribe of Levi was written Aaron, as instructed by God. Thus, in the messianic shadows of the Law, the children of Israel challenged God’s appointed priesthood/kohanim, and in the Substance we have a High Priest in Yeshua whom they also challenged with the Law of Moses. Hence, quickly/miraculously blossoming fruit symbolizes the restoration of God and a sign of acceptance in His sight. In the Book of Isaiah, we find that Israel would bud, blossom, and fill the world with fruits (see Isa. 27:6). The wilderness and wasteland would blossom as a rose (35:1-2). Yet we find that blossoming also comes with judgment on the wicked and the rebels: “Behold, your God will come in vengeance- the recompense of God; He will come and save you” (see 35:4). 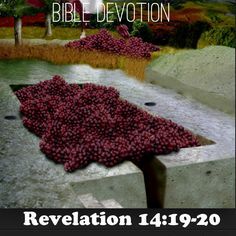 Further, blossoming was associated with opening the eyes of the blind, healing the deaf (35:5), providing a “Highway of Holiness” that the redeemed ones would walk on (35:8-9), and ransomed ones of YHVH returning to Zion, singing in joy (35:10). All these are signs associated with the Rod of Messiah, as a chosen priesthood after the higher order of Melchizedek (cf. Ps. 110). This is the “Rod from the stem of Jesse” and the Branch upon whom the Spirit of the LORD would abide (Isa. 11:1-10). He would strike the nations with the rod of His mouth (i.e., His testimony). This was made very clear by Prophet Jeremiah, to whom the Lord said, “Behold, I have put My words in your mouth. See I have this day set you over the nations and over the kingdoms, to root out and pull down, to destroy and to throw down, to build and to plant” (see Jer. 1:9-10 NKJV). The same message concerned Elijah restoring hearts for the Messiah in the Book of Malachi: that the Lord YHVH would break off fruitless and corrupt branches and uproot unfruitful trees. The sign that He gave Jeremiah was a rod of an almond tree, which meant God was watching to accomplish all His words (1:11-12)- salvation to the humble elect and judgment to the wicked. Hence, we find many messianic requirements of this otherworldly and everlasting priesthood: Healer with the Spirit of God, Prophet to the nations, and Deliverer of Zion at the end of the age. It is peculiar that the original rod of God that budded and blossomed with fruits, which came to signify so many messianic things, began with contention from the children of Israel over whom the Lord YHVH had chosen for His priesthood- over who would lead His people in the things of God and make atonement for their transgressions. Like the plight of Joseph, envy was the motive of the rest of Israel resisting the chosen ones in the wilderness, along with them not heeding the Lord YHVH. However, the people who originally rejected Joseph as a savior eventually accepted him, showing that God can turn back hearts. Likewise, they rejected Moses but came to follow him through the harsh wilderness journey. Further, they rejected Aaron and the Levites but ultimately heeded the testimony of God. Indeed, they even mocked and rejected David, but he became their beloved king. Israel imprisoned and killed some of their prophets, but they kept their inspired writings and eventually came to honor them. God said that they even rejected Him for their own leaders (e.g., Saul as king) and their pagan idols, yet praises are sung to Elohim YHVH to this very day as the old deities of their spiritual adultery have passed away as ancient history. It would be most peculiar if the Israelites had not collectively rejected the Messiah Yeshua, whom I believe they will eventually accept as a nation when they discern all the shadows of the Law and Prophets, and when their hearts are turned back as the One whom they have historically despised becomes the One who saves them. Yet, there is a cup of wine left for pressing in the Sun-King’s hand, for all those who continue to reject His will and truths: a cup of indignation to nations that likened to the Babylonians of old (see Jer. 25:15-33; 51:7). And the Messiah comes to fiercely tread the winepress, to bring forth His righteousness wine- to purge nations that lead the world in rebellion and reject His salvation and dominion. Indeed, the rejected Good Shepherd- the suffering Messiah ben Yoseph– comes back with a chalice full of vengeance to purge the world of the wicked, while those who follow His Word lead pure movements of the Holy Spirit (i.e., white horse in symbolism). These are the ones who will wear the garments of salvation, justice, and righteousness, because He, like Joseph, first had His own vesture dipped in blood for us. And this is the Divine message written in the shadows of old, in young Yoseph disclosing revelations of the wine-presser standing in the presence of his lord: He comes, and all the armies of God shall come with Him on the morning of the third day. The gates of Hell cannot prevail against them, for the Kingdom of Heaven, now on the move, was already decreed their possession from above for an everlasting dominion- to root out corruption and throw down dark principalities, to usher in the Day of YHVH as a new dawn for the wakening world. He smashes through princes and presidents, through kings and prime ministers, and through all who do evil as a Boulder through mortar, grinding them to powder, as a Rock rolling down from the Holy Mountain that is God. This is the Divine will, witnessed in things from ancient times for the age to come. And with all due zeal for that better age of tomorrow, it will come. Yet for national leaders and all who hear, there is no reason to fear if we honor the Lord and act according to His will. Just as there is a purging on the morning of the Day of the LORD, the third day will quickly turn into a time of unprecedented peace and joy. Indeed, there will be a great transformation of the people of God, which we will perceive via a living parable given by the Spirit during Christ’s ministry. There was another master of feasts presented with wine on the third day, and it concerns the appointed time of Christ’s marriage to Jerusalem. About seven miles north of Nazareth, in the town of Cana, a memorable wedding was attended by Yeshua and His followers, which foreshadows the “marriage of the Lamb” to the New Jerusalem Bride of believers. It was at this feast that the Lord performed the miraculous feat of turning water into wine, which His servants presented to the master (or orchestrator) of the event for tasting, much as the butler presented the wine to his lord on the third day. As the Jewish wedding foreshadows the Great King coming from Heaven to be joined with Jerusalem, Yeshua’s attending mother and disciples represent all who answer the call and do God’s will (cf. Matt. 12:50). The Gospel account sets the stage for His union with Israel by preceding it with Apostle Philip finding Nathanael and exclaiming that they had found Him whom Moses and the prophets had written- a similitude of Jews perceiving Christ at the time of His return. Nathanael was amazed that Yeshua knew that he had been under the fig tree (cf. Zech. 3:9-10), and Jesus considered him an “Israelite indeed, in whom there is no guile.” Thus, before the wedding, Christ said, “Most assuredly, I say to you, hereafter you shall see heaven open, and the angels of God ascending and descending upon the Son of Man” (cf. John 2:51; 2 Thess. 1:6-8; Rev 1:7). For Israelites, this brings to mind Jacob’s dream of the angels of heaven ascending and descending on a ladder to Heaven in Bethel (house of God), which was when he went to receive a wife from among kinsmen (Gen. 28:1-22). Hence, the literal passage is translated: “And” on the third day there was a wedding, which connects all the aforementioned signs with the marriage feast that they attended in Cana of Galilee. As for Cana of Galilee, Cana means reedy. Israelites utilized reeds for measuring, and from reeds we get the canon of Scripture- the full measure of Scriptures. Galilee means circle, which suggests coming back around. The region was often called “Galilee of the Gentiles” in those days, which suggests coming back around from Gentiles. Moreover, the Jewish wedding taking place in Cana of Galilee on the third day suggests that Jews will make a full circle by discerning Scriptures, with God calling them back and restoring their hearts with His Word. Thus, this implies that many Jews will again embrace Yeshua as Messiah as they did before Christian Doctrine became primarily of Gentiles. Coming down from God out of Heaven (in a vision, such as the one John was caught up in) simply means God’s will shall be done on Earth as it is in Heaven, just as Christ came down from Heaven but was literally born via the matrix of maternity. For this reason, Christ asked her, “What is it to Me and to you, dear woman?” when she told Him they had no wine. It was an actual question that we should all consider. Moreover, how was them needing wine at a Jewish wedding, on the third day, relevant to Christ’s own time and wedding? How did it relate to Jerusalem above, which is called the “mother of us all”? How did it concern Messiah, His family, His disciples, and His other servants attending it? The true wine that believing Jews and Christians (see Isa. 62:5-7) must seek (cf. Matt. 21:22; Luke 11:13; James 4:2) for the wedding is the Holy Spirit (cf. Acts 2:13-17; Eph. 5:18) transforming the water of the Word within us by the blood of Jesus Christ (see Luke 22:19-20). If we are filled with Ruach haKodesh and obey Him (see John 14:15-17, 21-26), we find a transformation of the water to something richer and deeper, perceiving that the Word of God is Spirit and life (John 6:63). As wine connoisseurs savor every sip of wine for its flavor to know the details of its ingredients, age, and perhaps origin, so do we carefully take in spiritual truths confessed in Scripture. Things that we thought were as plain as water, and did not previously perceive, have a new, fuller appearance and spiritual taste. While water is natural and refreshing, those who are to be presented before the Lord do well to perceive the purposeful works of the Spirit through the Scriptures. Our waters are turned into wine. The six standing water pots are people from the six millenniums before the union of the Great King and Jerusalem, which comes at the beginning of the Great Sabbath- the third day since the cross. The glorious transformation from water to wine is change in the elect before we are presented to God- the Master of the moedim feasts (see Rom. 12:1). We are first filled with the refreshing water of the Word that was first given for Jewish purification and by Jews (see John 4:22). The water being changed in the stone vessels represents changes within our stony or hardened hearts (see Ezek. 11:19) by the work of the Spirit. This is not only a transformation of our emotions, but also how we reason over God’s covenants. Paul preached that believers should “present yourselves as a living sacrifice, holy, acceptable by God, which is your reasonable servitude. And do not be conformed to this world, but be transformed by the renewing of your mind, that you may prove what is the good and acceptable and perfect will of God” (Rom. 12:1-2). Like the woman in Samaria who left her water vessel to Yeshua, at the well, and went spreading the good news about finding the Messiah (see John 4:6-29), we must leave our hearts and minds to the Lord, who transforms the waters into living waters. Although we remain who we are, in spirit we become Christ-like (cf. John 6:63; Rom. 8:29). There is a baptism by water, which signifies passing from death to new life as we immerse ourselves in the Word, but there is thereafter a baptism of Spirit (see Luke 13:16), whereby we discern spiritual things that are not perceivable to the carnally-minded- lest made very plain and simple. In two measures, and even on the third millennial day from the cross, we are changed and presented to God. The master of the wedding feast did not know where the better wine had come from. He called the bridegroom and praised him for saving the best for last. Christ, indeed, has saved the best of the Spiritually-transformed for last. As Scriptures disclose, our sins are removed as far as the east is from the west and are not remembered. The Lord of the moedim feasts only sees the wine of the covenant, just as Joseph’s father only saw the blood and not his sons sins. But the servants knew, and they knew Him who makes water into wine. We might say the Covenant of the Law was the first wine and inferior, herein insert a few passages from Paul, and call the New Covenant the better wine that was saved for last. Or, we might say that Jews under the Law are the better since they will lastly come to Christ as a nation. Further, we might say it has nothing to do with Jews or Gentiles, but the New Covenant is better the Old. Furthermost, we might even say that the Jewish apostles were the first and we are the last wine. However, if God so mingles the wine, and the master of the feast did not know from where the last wine came, it may be that we will never know which covenant best suits the taste of God. The Spirit is being poured like wine on (or into) all flesh in these last millennial days, from the Jewish apostles to those of us today (cf. Joel 2:28-32; Acts 2:15-20). As, for me, the scribe, I taste the same wine transformed from water from the beginning of Scripture, for the Spirit has so thoroughly mixed these things for this work. As the Lord said, “Therefore, every scribe instructed concerning the kingdom of heaven is like a householder who brings out of his treasure things [wine] new and old” (Matt. 13:52 NKJV). With people being born again for the coming Kingdom, it is difficult to know which wine is the last. Unfortunately, the seers of old were not given all pleasant prophecies to disclose, for the judgments of God are not all in favor of those who receive them. In the New Covenant, we find that the Messiah also had to give many unfavorable revelations. The harsh truth is, just as there are those who will be restored to live in the presence of the Lord on the third day, there are also those who through lack of repentance are appointed unto wrath. The question becomes: Why are those who receive unfavorable judgments likened unto the baker? First, we must perceive that bread is symbolic of God’s nutritious Word in the Bible. Hence, Christ was born in Bethlehem, which means house of bread. So bakers prefigure those who prepare the Word of God to feed the hungry. There was the Old Covenant likeness of God’s bread from Heaven in the manna that the children of Israel received in the wilderness, and there is the fulfillment of it in the sacrifice of Christ as preached in the Gospels. Cannibalism and blood gorging are forbidden in Scriptures, and this Christ knew, as well as how His words would be perceived. The objective, however, was to teach in parables and symbols to open the minds of those who are humble enough to consider them. Then they could come to discern mysteries of the Law and life. There was a greater reason for Israelites having to eat the Pesach lambs than simply filling their stomachs; doing so was a revelation of life sacrificed for their lives. There was a reason for God sending manna to sustain them in the wilderness, but they perceived only the obvious need. As pondered, there is a transcendent reason for why animals must eat other lifeforms to live, but the world does not discern it. God could have made photosynthetic plant-people for this world, feeding but from soil and sun rather than upon other lives. But all sustaining life comes from God, written in the shadows, and to reject what and whom God has given us to sustain our lives is to reject life. We cannot live except by taking life, which all the sacrificial feasts of the Torah witness to, and life comes from God’s love for sacrificing in His works for us. None of us are self-sufficient or self-sustaining, which is the message and essence of the covenants. And this should humble us unto righteousness in our mortal lives. (See 1 Cor. 3:2.) Life is to be zealously sought by the living, and since God is Life, we must become the predators as He has become the Prey, eating of His life for us through Christ. There is no place in all eternity for those who cannot humbly learn this lesson of dependency upon God, which is self-evident in our lives and the surrounding nature of the world. Most of us posses compassion for small creatures in the wild- their sufferings and sacrifices to hungry beasts- although they did no work of their own to come into the world; so how can we not have a little appreciation for the longsuffering of the One who has sacrificed His things and has worked through the long ages so that we could share in His life? How can we not appreciate His people being sacrificed to devouring empires, and even His Son at the iron teeth of the Roman Beast? Suppose that the Maker of the universe wanted to manifest Himself to humankind, walk humbly among us, and show His love for what He had made- throwing His arms open, saying, “I sacrificed so much for you all to live!” Yet He knew that in the age of mortals, in the testing of the spirits, that life itself is seen as the greatest sacrifice one can make, and the fleshly living are not quick to appreciate an appeal for gratitude and love. Perhaps He could put on a public display of being whipped and beaten bloody, and thereafter nailed nakedly to a piece of wood, hoisted up in the open air as onlookers mocked. After all, they were already doing it to each other and worse. He might as well volunteer as a victim of their evil, if it permits a chance to change billions of hearts and grants those who seek Him pardons for their evils. Those too hard of heart but to despise it would not be worth saving anyway. 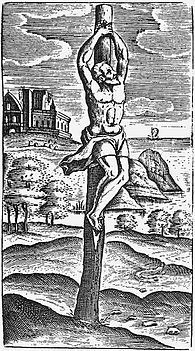 Moreover, the baker hung on a tree, with birds eating his flesh, symbolizes the life we must partake of through Christ’s sacrifice. Those who despise it will have it required of them on the third day. The baked goods in three, white baskets symbolize the pure foods of Scripture that we consume during these millennial days. If we do not eat of His sacrifice, as explained in the Word, we will not inherit eternity, for it is the great test of humanity- a mystery of God for our appointed times. Through Christ’s sacrifice, who was hung on a tree, we eat the “Bread from Heaven”– the Word given for the last days of the Divine week. We who believe figuratively eat of the flesh of Him whom was hung on a tree (see Gal. 3:13) and thereafter enter the coming Kingdom, which is hidden from carnal-minded people. In other words, God’s Word is like bread shared over three millennial days after the sacrifice, from which people eat to enter the coming Kingdom. During this time it is raised and exalted by the hidden leaven of doctrine. On the third day from the cross, the Kingdom hidden within the bread of the Word is fully raised with His coming. Yeast or leaven is something that exalts or rises, which can be good or wicked, depending on what or whom is being exalted. When Christ said, “Beware of the leaven of the Pharisees,” He was telling His disciples to beware of how they manipulate the Scriptures to pridefully exalt themselves. And this serves as a warning to practicing Christians and Jews who promote false doctrines to exalt themselves, that not all who say “Lord, Lord” will enter the holy Kingdom, even if they have prophesied or done other great works in His name or in the name of the Father. If they in their ignorance misrepresent the Word of God to exalt God, they have no sin in it, but when they are corrected unto better comprehension and yet continue in religious arrogance and pride, they forfeit all the good that they have done to dwell in rebellion against the Holy Spirit. It is better to feed the pure foods of the Word to refine others (see Dan. 11:35) than have it hanging over our heads at the end of the age. And when the leaders of the world learn of these truths from the preaching of the two witnesses, and resist the Lord’s coming Kingdom, they, too, will have His sacrifice required of them. Assuredly, all things will be revealed, and they will have no excuse for their rebellion. In Joseph’s plight we find that before honor comes humility (Prov. 15:33), and before greatness comes servitude (Matt. 23:11-12). He who was lifted as a curse on the tree (Acts 5:30), as the least of the people, became the Head of a massive body of believers (see Col. 1:18), and through this He draws all people to Himself (John 12:32). Taking on the form of a servant (see Phil. 2:5-11) and being obedient unto death, God has exalted Him to the highest honor. As prophets and the apostles have written, to Him every knee shall bow. But it is not merely because of His exemplary servitude and faithfulness to God that His name has been exalted above all others; many having been martyred servants. It is because all the works of God in Scriptures were done through Him, to witness to His inheritance. No other kingdom or dominion has ever been so deserved and patiently awaited. Joseph’s Divine revelations were forgotten by the chief butler, and thus he was left in prison for two more years before ascending to glory; and we find that this foreshadows the Messiah ben Yoseph’s revelations being forgotten by most of His people, with Him waiting two thousand years for His coming Kingdom. As Bible-believers, we often get so caught-up in our work for God, as the butler did in serving his lord, that we forget that what God is doing is to bring about His Kingdom centered on Christ and not our servitude. Concerning this book, we too, must wait before reading the rest of the story of Joseph’s glory and revelation as a savior to his family. While the symbolism of bread and the true Manna from Heaven is still fresh on reader’s minds, we must serve some of Messiah’s baked goods to those who are now prepared to feast on them. After the harbinger of Christ, John, was beheaded for preaching against King Herod that his wife was an adulterous (for she was his brother’s wife), the apostles went and reported the incident to Yeshua. Thereafter, the Lord called them away to a private location near Bethsaida, meaning fishing house, which was deserted (Luke 9:10), so that they might “rest for a while” (see Mark 6:31). 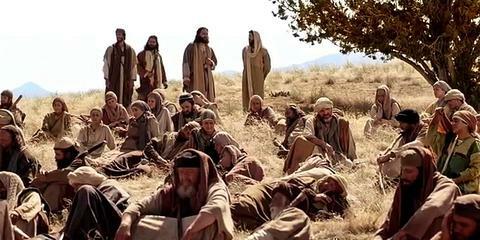 There they sat at ease in the mountains along the shore of the Sea of Galilee- again, Galilee means circle of Gentiles. Yet their rest was short-lived. Multitudes began arriving as they caught word that they were there, seeking healing for various issues and to perhaps see the famous Rabbi from Nazareth (Matt. 14:14). Many of them had followed His boat from the surrounding cities (14:13), which appears to contradict the entire notion of them resting. These things, however, were orchestrated by God to witness to the coming Sabbath of the Lord, a rest which cannot remain hidden, and the gathering of the elect. As the harbinger of the Lord was slain, so will the two witnesses be for testifying against Babylon. During the years of their prophesying and teaching in Israel, many Jews will begin following Christ. Indeed, the Gospel will have made a full circle from Jews to Gentiles and also to Jews again. They will learn of things of God and receive the Good Shepherd that they had rejected as a nation. This sets the prophetic table to discern why 5,000 were fed from two fish and five loaves of bread. Christ’s disciples were concerned about feeding the multitude bread, but Christ was more concerned about feeding them doctrine and preparing a mystery. The wording- them being “like sheep not having a shepherd”- suggests that the timing is post-crucifixion. Sheep going their own ways suggest Israel (see Isa. 53:6). Christ, thereafter, beginning to “teach them many things” suggests them coming back to the revelations of Christ. An example of this is when Christ was crucified and the apostles were temporarily scattered, but thereafter the Lord opened the Scriptures to them via the Holy Spirit. Thus, this multitude of Israelites coming to Christ in Bethsaida for feeding correlates with a national awakening to Christ. The above passage can be interpreted as 2/3 of the people would be cut away from the land after the Good Shepherd was struck, according to the Word of God (His Sword), and this would have began when the Romans came against Jerusalem and Judea. Or, two parts could suggest Jews being slain in the land for two millenniums from the cross, but then delivered on the third day during Jacob’s troubles. If the former rendering is correct, one must question how Jews being killed and tested in trying times might turn the remaining third of them to call upon the Lord in a way that is relevant to the Good Shepherd being killed. For almost two thousand years they have been tried in tribulations and yet they collectively despise and reject Jesus to this day. But perhaps testing the third part or trying them like gold suggests more than physical refinement. Perhaps they will be tested by Word of God to turn back their hearts to the faith of their fathers, and then God would respond to them and deliver them on the third day. Then again, both could be correct, as is often the case with God’s Word. If we postulate that the slaying of 2/3 in the land was after some high priest or other shepherd of Israel was killed, sometime before Christ, we must ask where a perfectly refined 1/3- as gold before God- comes in, for there has never been a time in Jewish history when 1/3 were saved, after most of the nation were slaughtered in the land, and left as a holy, perfectly refined people before God. There have always been both righteous and unrighteous Israelites, whereby the righteous has longed for a holy, glorified nation under the Messiah. Besides this, we know that the Shepherd of Israel or Shepherd of the people usually refers to God (cf. Ps. 23:21; 80:1; Isa. 63:11), Messiah (Isa. 11; Ezek. 34:23), or biblical leaders who foreshadowed the Messiah (e.g., Cyrus, Isa. 44:28). And the wording is reminiscent of Joshua (an antitype) being chosen by Moses to lead the Lord’s people into the Promised Land: “Let the LORD, the God of the spirits of all flesh, set a man over the congregations, who may go out before them and go in before them, who may lead them out and bring them in, that the congregation of the LORD may not be like sheep which have no shepherd” (Num. 27:16-17 NKJV). Moving on, Yeshua haMashiach saw the multitudes arriving and had compassion on them because they “were like sheep not having a shepherd,” and His disciples were concerned because they had no bread. He was the Shepherd that Joshua prefigured who would be struck for the people, and Jews scattered around the Gentile nations would come back around to know and receive His Manna from Heaven- His doctrine of salvation and the Kingdom. God sent bread down from Heaven through Moses, and through Elijah multiplied some meal for a widow during three and a half years of drought, but the disciples did not bring these things into consideration as they worried for the multitude. Someone greater was in their midst, but they did not recall that bread multiplied to the masses was a portent of the Messiah. As we know from Scriptures, David’s sons sat on his throne for approximately four hundred years after he received the promise from God, but for the overflow of wickedness in Jerusalem and Judah, they went into Babylonian captivity. David’s line of Jerusalem kings was broken because they had not kept the Lord’s covenant and testimonies. Nevertheless, the Christ was prophesied to come with a new covenant of peace and reconciliation, whereby would come a government and dominion that would never pass away (see Isa. 9:6-8). They knew there were about 5,000 men because they sat them “down in ranks, in hundreds and in fifties” (Mark 6:40) like an army. And the disciples knew how many loaves and fish they had because He told them to go and see (6:38). The reason He caused them to know this was not but to show that a miracle had been done, but the numbers concern the work of salvation for Israel. John the Baptist prophesied that the Messiah would “gather His wheat into a barn, but He will burn-up the chaff with unquenchable fire” (see Matt. 3:11-12). Gathering the fragments of bread in twelve baskets symbolizes God gathering the saved of all the tribes of Israel. The instructions “Gather up the fragments that remain, that nothing be lost” did not mean that Jesus and His disciples would be eating their leftovers for the following weeks, but rather they were given so that those who reason over these mysteries might make comparisons and comprehend what the numerical signs mean. Gathering up the bread that none would be lost was a sign of gathering those who are made like the Lord. The passage does not mean that an extraterrestrial came down and made millions of clones that he will come back for and take into deep space. It means that the Doctrine that He gives concerning His sacrifice transforms our minds so that we are Christ-like and have the Spirit of God dwelling in us. It reprograms the carnal mind to dwell upon Divine, transcendent things, and it changes hardened hearts. Like the bread He took and divided, saying, “Take this and eat” on the crucifixion Passover, we share the Doctrine of salvation. 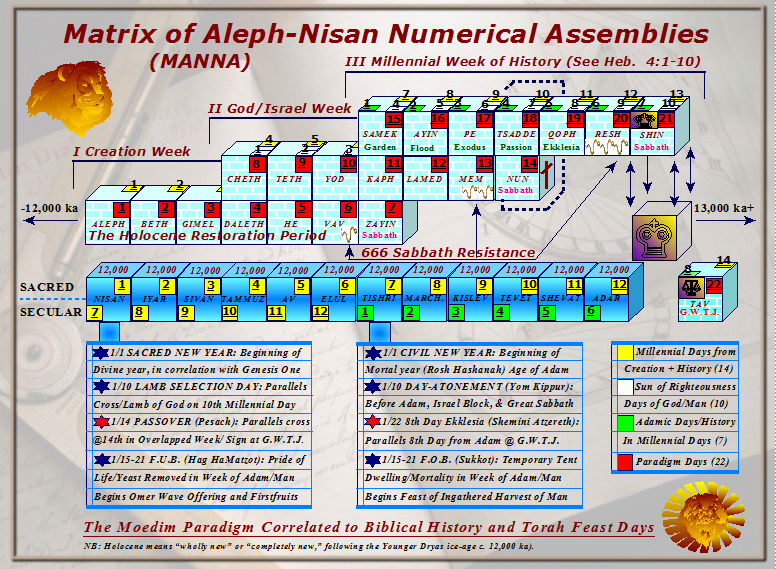 So the 12 baskets of bread fragments represent the gathered and saved of Israel during the millennial week, and on the last day they will receive everlasting life. The 5 loaves which fed 5,000 means that the Lord shares His Word among them for 5 millennial days, multiplying the children of Israel. From the time Abram left Ur of the Chaldeans with the Divine promise of being a great nation unto the completion of Israel with the Great Sabbath is 5,000 years. (See the Key of Knowledge.) The 2 fish being shared by the 5,000 means that the Messiah comes in the flesh twice to Israel- the first and second comings. With the 5 loaves of bread, we find God shining His lamp on His chosen Messiah. The 5 loaves were Divine showbread like the 12 loaves of showbread in the Holy Place of the Temple, which the Lamp of God- the Menorah- shined on for priests to see. Every week the showbread on the table was replaced with 12 fresh loaves, on the Sabbath day- 12 loaves for every 7 days. The Mashiach ben David feeding His multitude of believers was foreshadowed by King David sharing this sacred bread with his fighters. David was hiding from King Saul who sought his life because he was anointed to be the new king of Israel. He had a small band of men who were hungry, so he talked the priest out of five loaves of showbread as it was being replaced on the Sabbath, which was against the law. 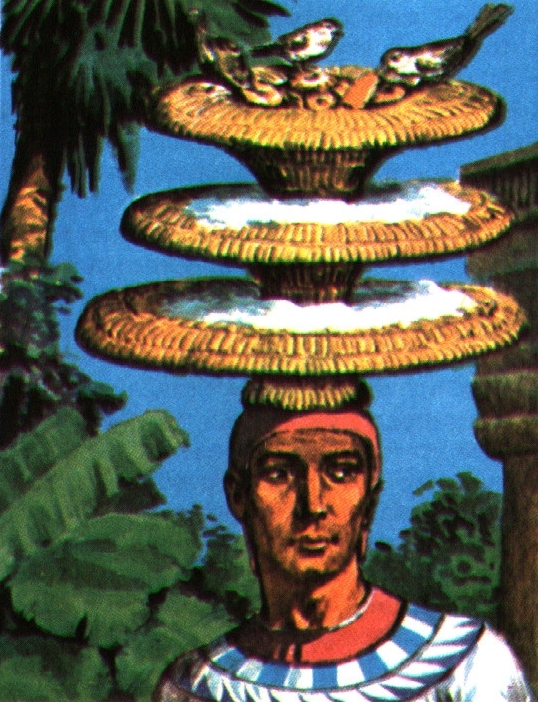 He achieved this by telling him that he and the hiding men were on a secret mission from the king. And the bread being replaced from before the Lord was no longer holy, but it would be clean in his men’s containers. It was the Sabbath but also the third day since he had fled, and while David was there he received the sword of his enemy Goliath from the priest, seeing that he was about to battle his enemies. What I am suggesting is that Christ leading His apostles to a secret place for rest and feeding the multitude five loaves mirrors the holy bread that David gave his warriors, whom he said were clean with consecrated vessels. Just as David’s life was sought, so was Christ’s, even though He charged His disciples not to tell anyone He is the anointed One, and sought to hide His Divine works (see Matt. 16:20; Mark 9:9). With David being anointed according to God’s instructions, he truly was on a secret mission of the King, only of God and not King Saul. Likewise, so was Yeshua- the Messiah ben David. And these things also look forward to the Sabbath to come which is the third day since He left, when He goes to battle. Christ as the eternal High Priest after the order of Melchizedek is higher than any priest before Him. Being the Messiah, He is greater than any king before Him. Whereas the priests only replaced showbread that symbolizes God’s nourishing Word to His people, the Messiah brought the fresh Manna from Heaven and a new covenant as prophesied. He is Lord of the Sabbath- not merely Sabbaths in mortal weeks, but the Sabbath in which our weekly Sabbaths serve as shadows. He did not imitate the things of King David; King David was led by God to confess Him in shadows. He is the Substance of all the Divine works of old. King David did not know why God was leading him into situations like a puppet, nor did patriarchs or prophets fully discern what their own lives were confessing, but the Messiah knew both the shadows and how His works are the substance, and what both meant before God. Nevertheless, if in the shadows King David took five of the twelve loaves of showbread from the Holy Place on the Sabbath, leaving seven loaves, we should look to the Substance in Christ to find the remaining loaves, so that none should be lost. Thus, to the Gentiles and the churches we shall go, from which God chooses people for His coming Kingdom during seven millennial days. Just as the physical bread multiplied for those who received it, the bread of the Word multiplies in mysteries for those who are able to receive them: “…to fulfill the Word of God, the mystery which has been hidden from ages and from generations, but now has been revealed to His saints. To them God willed to make known what are the riches of the glory of the mystery among the Gentiles: which is Christ in you, the hope of glory” (Col. 1:25-27 NKJV). Indeed, those of past ages are not lost, nor those not born Israelite in the flesh, for even by “adoption” the Lord discloses “the mystery of His will. According to His good pleasure which He has purposes in Himself, that in the dispensation of the fullness of the times He might gather together in one all things in Christ, both which are in heaven and which are on earth- in Him” (Eph. 1:9-11 NKJV). Thus, as Paul goes on to say, there is an inheritance in the Kingdom of Heaven, whereas those who hear and believe the Gospel truths are sealed by the Holy Spirit. So Gentile believers are also the gathered bread of the Lord in “fellowship of the mystery, which from the beginning of the ages has been hidden in God (see Eph. 3:6-11). In fact, in the days that Israelite apostles shared the Gospel, they spoke to the Ekklesia, a called-out assembly, but in later centuries became known as “the Church.” This great assembly, in fullness, is of Jews and Gentiles from all ages since Adam. In the greater scheme of Divine things- the panoramic picture- a suggestion comes from the Lord commanding His apostles to pass over the Sea of Galilee (see Mark 6:45), which again means circle of the Gentiles, and that is that the apostles would be instructed to go to the Gentiles and preach the Gospel after His death, resurrection, and ascension. Passing over the Galilean sea of itself does not demonstrate this, for other disciples were told by their rabbis to pass over it to Bethsaida – into the fishing house– for this or that reason. But in this incident, the Lord came walking on the sea and they thought He was a ghost. The Messiah had first departed from them and ascended into the mountain to pray, but then they cried out when they saw Him as a ghost walking on water (see Mark 6:48-49). This suggests the post-ascension event of the Holy Ghost coming to them on the Feast of Shavuot, which is called Pentecost in Greek, when they began to speak in tongues and preached the Gospel to people of all nations in Jerusalem. Just as the wind blew hard on them as they were gathered in the boat, on Pentecost “a rushing, mighty wind” came and filled the entire house. And just as someone standing on water means standing on the Word of God, walking across water means covering the Word from one end to another. Some of those who witnessed their preaching at Pentecost thought they were drinking too much wine, but they were filled with the wine of the Spirit and began to cover the things of Christ in the Scriptures (see Acts 2:14-28). The Lord had already told them that when “He, the Spirit of truth, has come, He will guide you into all truths; for He will not speak on His own authority, but whatever He hears He will speak; and He will tell you things to come. He will glorify Me, for He will take of what is Mine and declare it to you” (see John 16:13-15 NKJV). Speaking of things that are His, the second sign of the faith going to Gentiles was went some of the Pharisees and scribes saw some of His disciples eating their bread with unwashed or defiled hands (see Mark 7:2-5), and thus complained to Him. Answering this, Christ cited a passage from Isaiah about “this people” honoring God with their lips but having their hearts far from Him, teaching their own doctrines and traditions- religious precepts- as commandments from God (see Isa. 29:13-15). He asserted that they were breaking true commandments and dishonoring mothers and fathers by justifying children not tending to them, with the excuse of Corban which were but gifts to the religious leaders rather than doing God’s will. He then explained to His disciples that righteousness does not come by avoiding certain foods, as many religious people think, and indeed kodesh foods are a big part of Judaism. What defiles people is what comes from evil thoughts of the heart, which are manifest in “adulteries, fornications, murders, thefts, covetousness, wickedness, deceit, lewdness, an evil eye [Jewish idiom], blasphemy, pride, foolishness” (Mark 7:21-22 NKJV). The Torah’s regulations largely consist of outward cleanliness, which was of great importance for an army of people dwelling so tightly together during the wilderness journey. But the Pharisees took those commandments to extremes and added to them while their hearts were hardened against Spirit of God and the meanings behind things written in the Law. If one cleans a table with a disinfectant cleanser, the table is not made holy before God, it is merely outwardly clean, but to this day religious people present themselves as pious and holy by what they wear, touch, or eat. Often this is while their hearts of full of bitter deceit, pride, and evil ideas. This second sign represents the Gospel going to the Gentiles because such things caused major dissensions between some Jewish Christian as the Gospel began to spread to the Gentiles who were not under the wilderness covenant and its precepts. Even Christ’s own apostles had difficulty with these issues, for they were religious Jews who held such things dear. Indeed, to this day there are disagreements among Christians as to what precepts of the Law should be kept concerning feasts and what should and should not be eaten. The third sign of the Bread of God going to Gentiles came when Christ went to the region of Tyre and Sidon, entered a house and wanted no one to know of it, “but He could not be hidden” (see Mark 7:24). Tyre, meaning rock, and Sidon, meaning fish, were where King Solomon received his supplies to build the first House of God in Jerusalem, c. 960 BC., so first we find the Lord acting exclusionary and not wanting people to know about Him, but Gentiles heard that He was in the House and began calling on Him. He could not remain hidden. This should by now be self-explanatory to readers of this book. Nevertheless, the table on which food for children is prepared means God is preparing scriptural foods for His people, which were, until the New Covenant, only the children of Israel. The Grecian was saying that even Greeks hear of God’s things and receive a little of it, although often in secret from Jews, like puppies under a table. It would be a small thing for Him to share a few crumbs of the bread with her and heal her daughter of what vexed her. And because of her faith, expressed in what she said, her petition was met by the Lord. The fourth and final sign of the Word of God being shared with the Gentiles, before the great multitude that represents them were fed with fish and bread, was after Christ departed the cities from which the Temple was built, going through the region of Decapolis, meaning ten cities, again to the Sea of Galilee (8:31). When the ten days representing Israel (see Moedim Paradigm, MANNA) were complete, God began bringing in Gentiles as “living stones” of the spiritual Temple He was building that includes people from all millennial days. Those who were once deaf to the things of God would begin to both hear and proclaim the good news. This came when the Spirit came as tongues of fire on Pentecost, and they began speaking in various tongues proclaiming the Lord’s wonderful works. In these parable events, we covered the multitudes being fed the Word of God, but notice that hearing comes from one being pulled aside unto the Lord. With this in mind, we proceed into the four thousand men fed with a few fish and seven loaves of bread. Unlike the former multitude who could have been sent “into the surrounding country and villages and buy themselves bread,” the latter multitude would faint going back, for many of them had come to the Lord from diverse places afar off. This suggests people from distant lands rather than Israelites being at home. And notice that they journeyed with the Lord for three days, which in Divine days is three thousand years- the time left in the workweek since the cross at the close of the fourth day from Adam. The possibility of their return “to their own houses” speaks of nations other than the House of Israel or House of Judah. Notice also that the exclusive place that the multitude representing Israel sat down in was a place plentiful with grass, whereas the new multitude must met Him in a wilderness, which also speaks of things to come during the Apocalypse. Perhaps the only mystery left is that of the 4,000 that were fed, and even that is no longer a mystery to keen readers. Nevertheless, the 4,000 exemplify the fact that the Gospel went out to Gentile after the cross of Christ, four thousand years since the beginning of Adam. Without the cross, there would have been no New Covenant or new Bread from Heaven to share with the nations. Yet from that time, a Doorway has been given that covers people from all seven great days, which, again, are presented as the fragments gathered in seven baskets. No exact number is given for the “few small fish,” which may represent those who eat of the Lord’s sacrifice for three days or allude to the fact that the “fishers of men” would share the meaty truths of His sacrifice with those who could hear. What amazes me is that the Pharisees immediately following this sought a sign, but all the signs were hidden from their eyes. What may be more amazing is that the apostles still did not perceive the meaning of the bread. And perhaps most amazing is the fact that almost two thousand years later these things are not discerned and taught in the churches. Indeed, one is left wondering how the Lord has suffered us through the ages. A clue may lie in Christ soon after healing a blind man, wherein the first time He touched Him his vision was restored but came blurred, whereas he saws people as walking trees. It was only on the second time that he saw everyone clearly (see Mark 8:2). Indeed, it is only now that we approach the second coming of the Messiah that His works become clear and all things are restored. Another clue may lie in the fact that most religious leaders and secular leaders exalt their own doctrines and domains, and even followers of the Lord sometimes do not discern it, or where they go astray, having blurred spiritual vision by carnal reasoning (see Mark 8:31-38). Concluding these things, there is no reason that Bible-believers should fear missing the hidden things of the Lord’s Bread, nor stay in the dark, not perceiving the Substance of all the shadows, for a promise is left to us- Jews and Gentiles- from the Messiah: “The one having an ear, hear what the Spirit says to the Ekklesias. 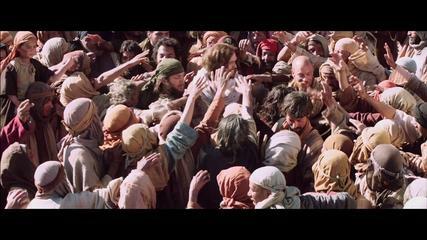 To the overcoming, I will give him to eat from the hidden manna” (Rev. 2:17). As He said, there is no mystery that will remain hidden, and there is no reason to believe that those who seek will not receive. In the next article we will continue to examine the plight of Joseph in light of Christ. There we will leave the pit and prison, and the messages to the butler and baker, behind, and figuratively skip over two thousand years to the second coming of the Great King.